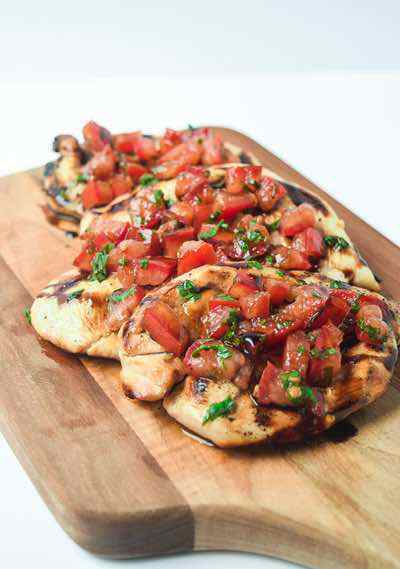 You can’t go wrong with chicken breast while on the Paleo diet, as long as you choose organic varieties of it. It goes well with most any vegetable, and it is easy to cook up in several different ways. It can be grilled, baked, and even fried. That’s right, fried chicken is acceptable on the Paleo diet as long as you are frying it in an approved oil and bread it with something other than all-purpose flour. 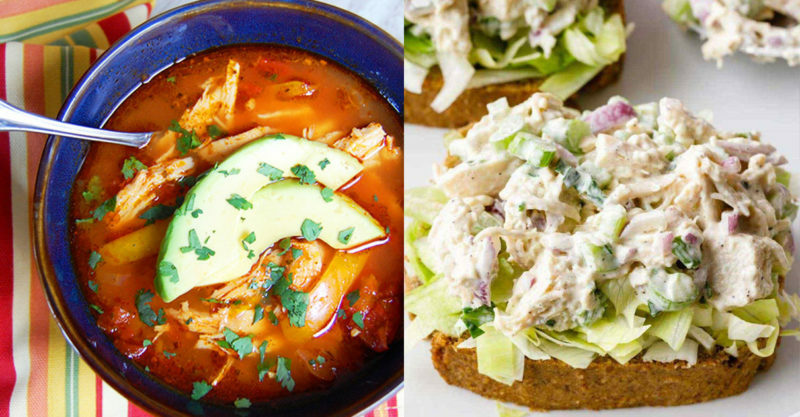 Choose any of these Paleo chicken breast recipes and you’ll be set as far as your meat requirement goes for that meal. 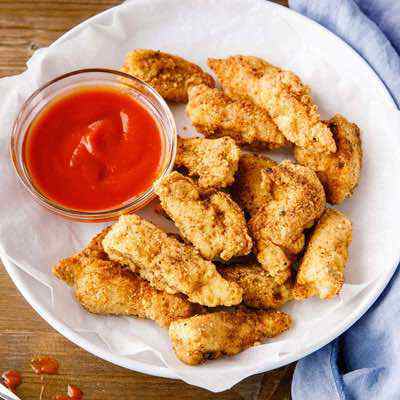 Homemade chicken tenders are a fun finger food for a casual lunch or dinner. 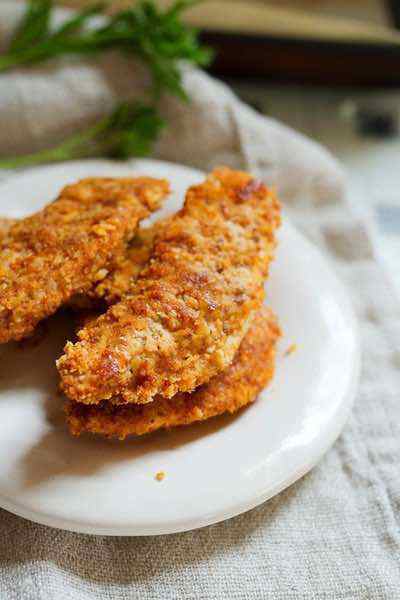 Breaded in almond flour, coconut flakes, and paprika, these chicken strips are tender and delicious. To get the paleo chicken tenders a nice golden brown, turn the oven to broil for the last couple minutes of baking. 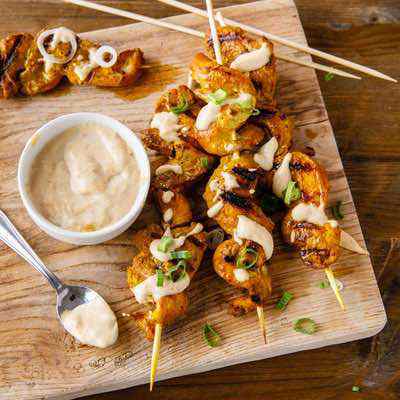 Whip together the honey and mustard while the chicken is cooking for the perfect dipping sauce. 1. Preheat the oven to 375 degrees F. Line a baking sheet with parchment paper. In a small bowl, combine the almond flour, coconut flakes, paprika, cumin, and garlic powder. 2. Season both sides of the chicken strips with salt and pepper. Take a piece of chicken, dip it in the egg, and then dredge it in the almond flour mixture. Lay the chicken on the prepared baking sheet and repeat with remaining pieces. Bake for 15-18 minutes until cooked through. 3. While the chicken tenders are baking mix together the honey, mustard, and apple cider vinegar for the dipping sauce. Serve alongside the chicken tenders. 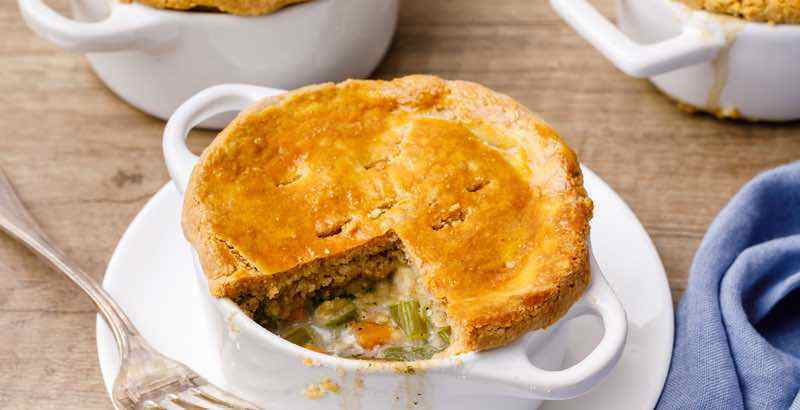 Not many dishes are as comforting as delicious homemade chicken pot pie. This is a simplified paleo recipe of the traditional dish, meant for baking in ramekins with crumbled pie crust for the topping. You may have leftover crust as well, which is great for making miniature pies. 1. 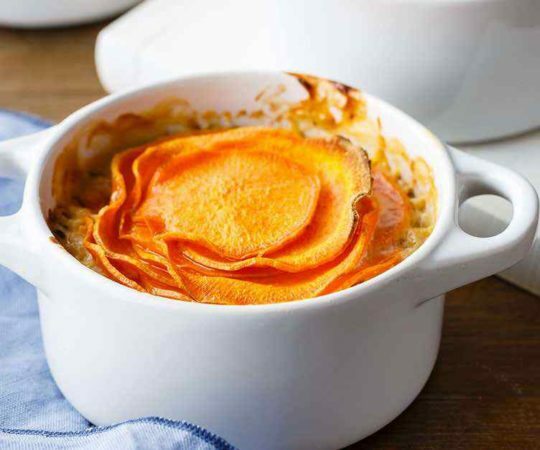 Preheat the oven to 400 degrees F. Line individual ramekins with a thin layer of pie crust, reserving some for the topping. 2. Heat the olive oil in a large saucepan over medium heat. Add the carrots, celery, onion, mushrooms, and thyme to the pot. Stir in half a teaspoon of salt and cover. Cook for 10-12 minutes, stirring occasionally. Add the chicken stock and bring to a simmer. Stir in the spinach and cook for 5 minutes. 3. Place the arrowroot powder in a small bowl and whisk with one tablespoon of water to prevent clumping. Add the arrowroot and the shredded chicken into the saucepan and stir. Reduce the heat and cook until the mixture reaches a creamy texture for the filling. Remove from heat. 4. Divide the filling among the ramekins. 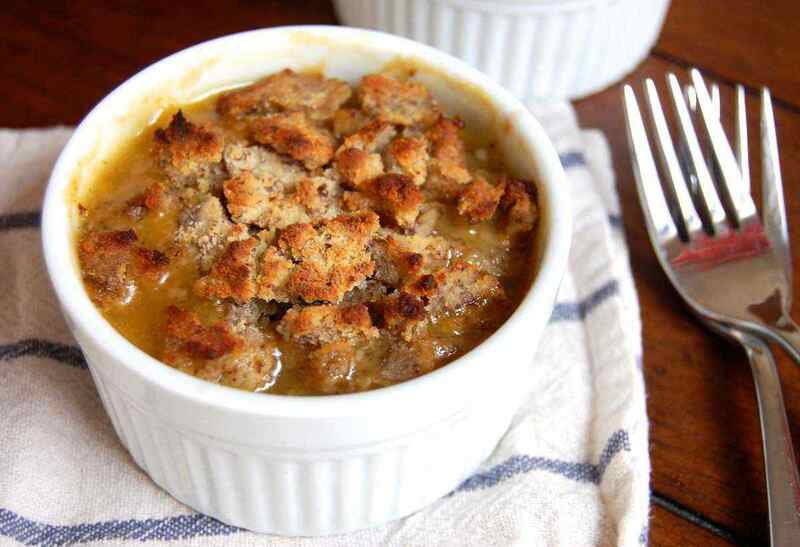 Top with extra crumbled pie crust. Bake for 13-15 minutes, until bubbling and the top is golden brown. Serve immediately. Stuffed peppers provide a good balance of vegetables and protein in one hearty meal. 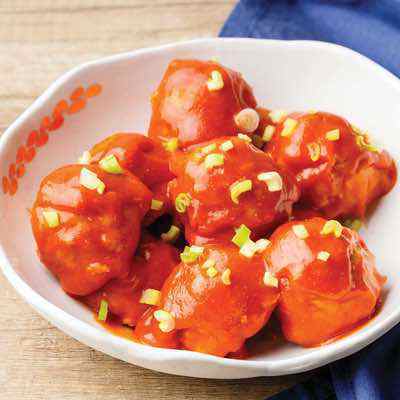 For this version, chicken is baked and then tossed with buffalo wing sauce to give it extra spice before being stuffed into the bell peppers. 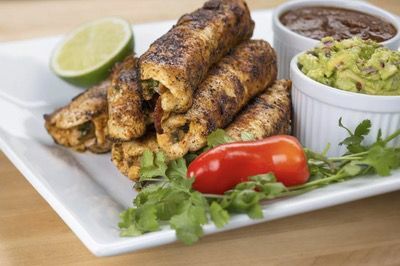 Serve with a side of guacamole or salsa, with extra cilantro for garnish. 1. Preheat the oven to 350 degrees F. Coat a baking sheet with coconut oil spray. Place the chicken breasts and onion on the baking sheet. Drizzle the ghee over the chicken breasts. Sprinkle the entire pan with parsley and garlic powder. Season generously with salt and pepper. Bake for 25 minutes or until the chicken is cooked through. 2. Meanwhile, bring a large pot of water to a boil. Cut the stems and very top of the peppers off, removing the seeds. Place in boiling water for 4-5 minutes. Remove from the water and drain facedown on a paper towel. 3. Once the chicken is done cooking, shred with a fork. 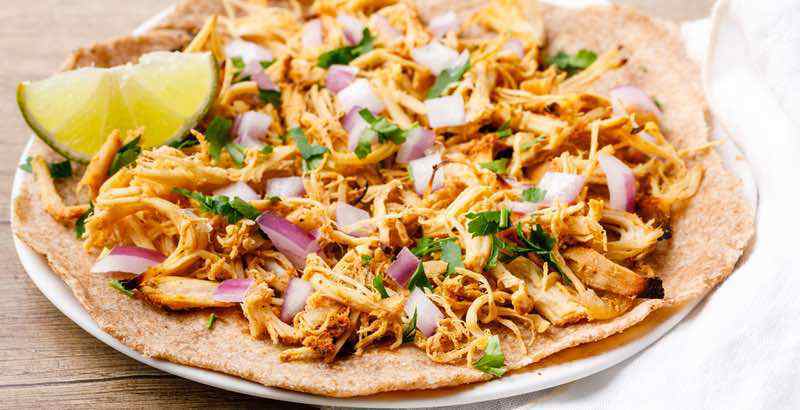 Combine the shredded chicken with the hot sauce and cilantro in a bowl and stir well to coat. 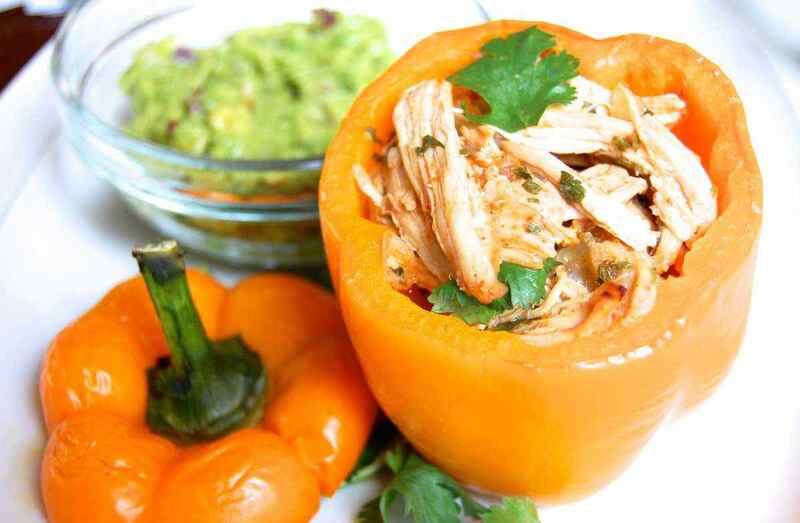 Spoon the chicken mixture into the bell peppers and place in a greased baking dish. Bake for 20-25 minutes or until the peppers are cooked to desired doneness. Serve with a side of guacamole. 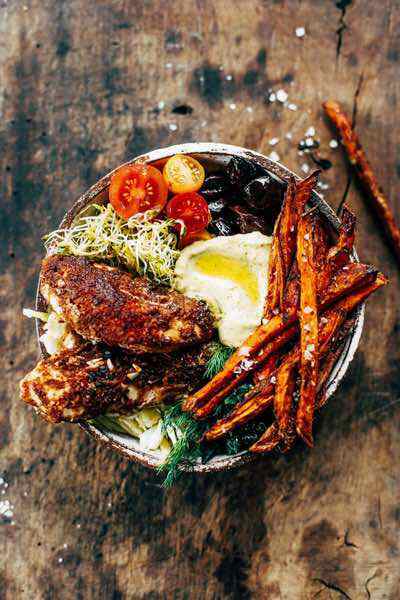 This healthy, well-rounded paleo chicken meal is great for weeknight dinners. The recipe only requires one pot to cook all of the ingredients in. Feel free to add mushrooms, bell peppers, or carrots as desired. 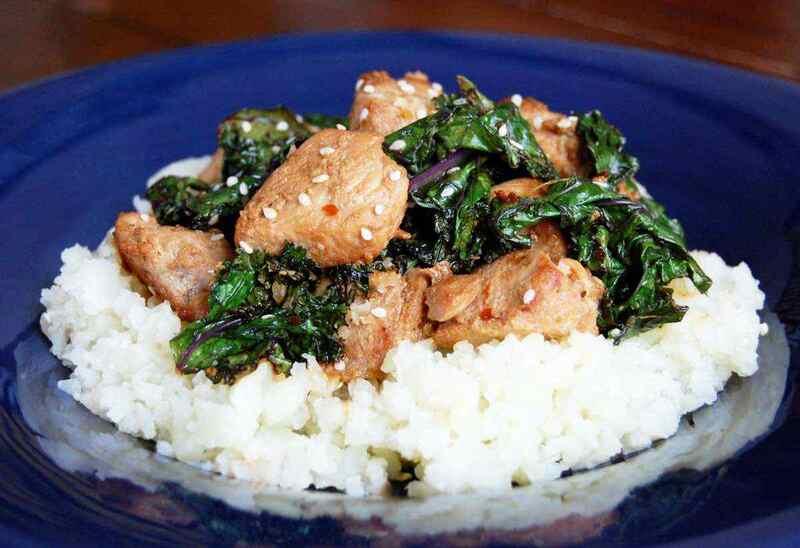 The delicious sweet and savory sauce balances out the usually bitter kale and adds plenty flavor to the stir-fried chicken. 1. In a small bowl, mix together the ingredients for the sauce. Place half of the marinade into a shallow dish with all of the chicken. 2. Prepare the kale by removing the center stems and either tearing or cutting up the leaves. 3. Melt the coconut oil in a large skillet over medium heat. Add the onion and sauté for 4-5 minutes. Add the chicken and cook for 3-4 minutes, until no longer pink. Stir in the kale and the remaining sauce. Cook for 4-5 minutes until the kale is wilted and the chicken is cooked through. 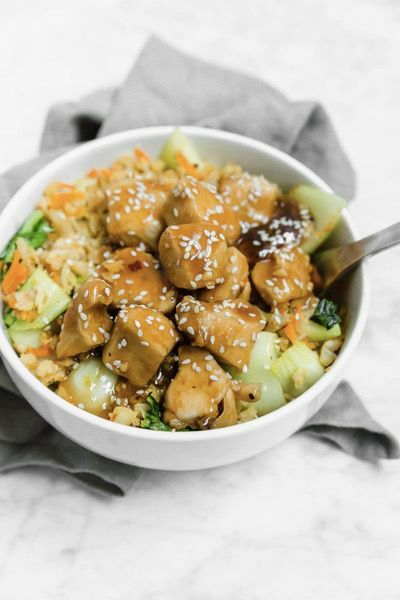 Serve over cauliflower rice, topped with sesame seeds. 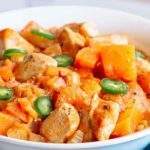 Making chicken in the slow cooker is an easy way to impart a lot of flavor into an otherwise simple dish. 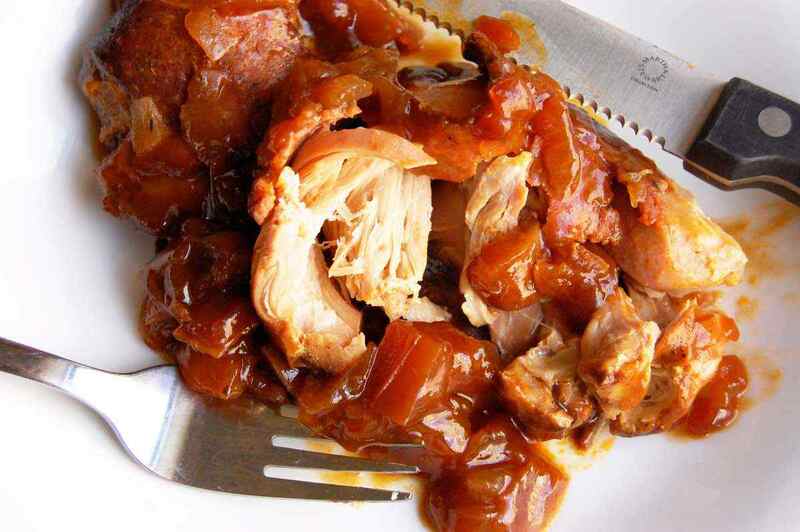 In this recipe chicken breasts are wrapped with bacon and then smothered with homemade bbq sauce to create an extremely delicious dish. The recipe provides guidelines for making your own bbq sauce, or you could use what you have on hand. This will quickly become a household favorite. 1. 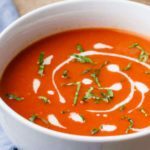 In a medium bowl, whisk together the tomato sauce, water, vinegar, honey, lemon juice, onion powder, pepper, mustard, paprika, and salt. Stir well to combine. 2. Wrap the chicken with the bacon slices and place in the bottom of the slow cooker. Top with the diced onion and apples. Pour the barbecue sauce over everything. Cover and cook on low heat for 6 hours. Serve warm. 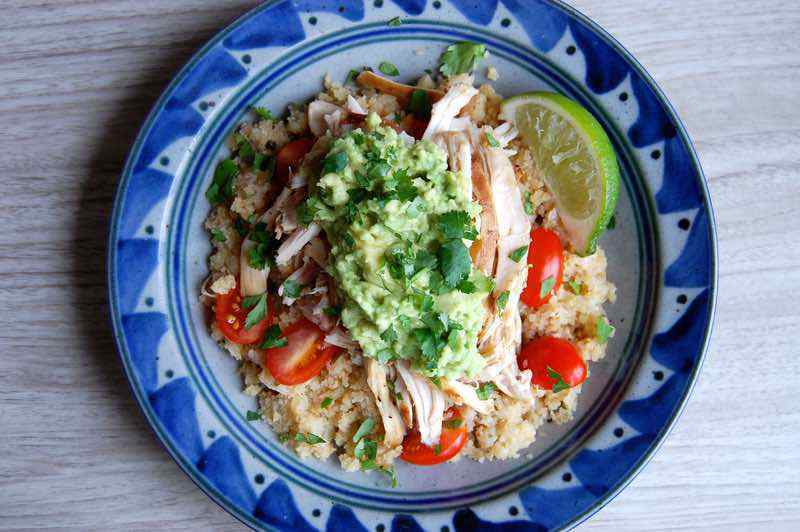 This addictive and soul-satisfying paleo chicken cauliflower rice bowl is inspired by the chicken bowls you can get at a fast casual restauraunt, without all of the added calories. Created in layers, the ingredients can easily be adjusted based on what is in your pantry. 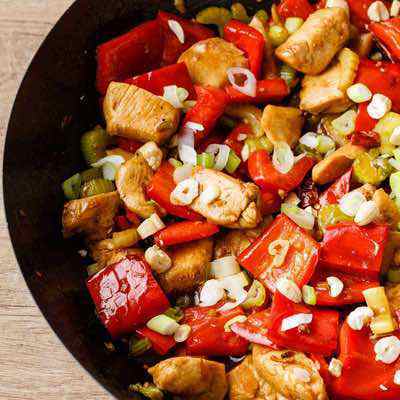 Sautéed onions and peppers can also be added to make it a sizzling chicken fajita rice bowl. 1. Combine the salt, cumin, chili powder, and paprika together in a small bowl. Pat the chicken breasts dry with a paper towel and then rub with the spice mixture. 2. Heat the coconut oil in a large pan over medium heat. Add the chicken and cook for 6-7 minutes per side, or until no longer pink. Shred with a fork while still warm. 3. Place the green chilies into the pan and cook for 2-3 minutes. Add the shredded chicken back into the pan and stir to combine. Remove from heat. 4. To assemble, place the cauliflower rice and diced tomatoes in the bottom of a bowl. 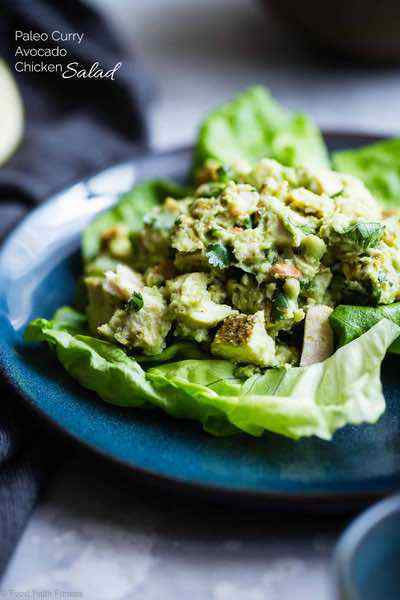 Top with the chicken mixture, smashed avocado, and fresh cilantro. Finish with a squeeze of lime and serve. 1. Place the almond flour, arrowroot flour, coconut flour, salt and baking soda in a food processor and pulse a few times to combine. With the processor running on low, add the ghee or coconut oil to the processor and process until the mixture resembles coarse crumbs. 2. Slowly pour in the water, processing just until a thick dough forms. Allow to rest for 5 minutes. Wrap the dough with plastic wrap and refrigerate for one hour. 4. In a bowl add the chicken, bell peppers, chopped onion, garlic powder, onion powder, cumin, paprika, salt, cayenne pepper and black pepper. Toss to combine. 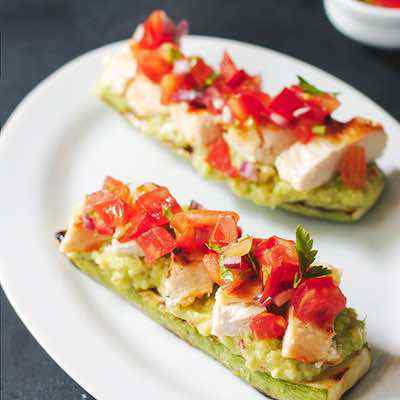 Spread the chicken, bell peppers and onion into an even layer on a baking sheet. 5. Bake in preheated oven for 15-20 minutes or until the chicken is cooked through. Remove from the oven and set aside. 6. 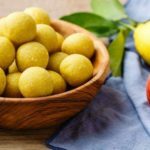 Remove the dough for the refrigerator and divide the dough into 4 equal balls. Place a ball of dough between two pieces of parchment paper and using a rolling pin, roll out to a flatten 6 inch round. Carefully remove the top piece of parchment paper. Leave the bottom sheet of parchment paper on. 7. Preheat a non stick skillet over medium heat. Place the tortilla, parchment side up, onto the hot skillet. Carefully remove top piece of parchment paper and cook for 30 seconds. Flip and cook for another 30 seconds. Wrap the tortilla in a tea towel to keep warm. Repeat the process with remaining dough. 9. Place 1 tortilla on the oven tray lined with baking paper. 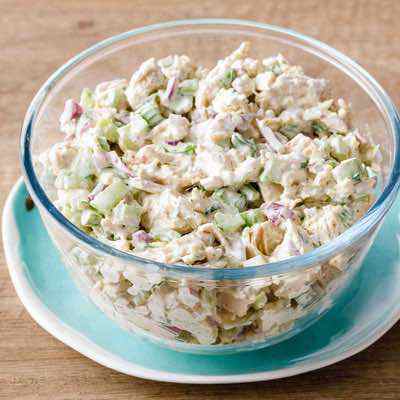 Top with half of chicken mixture, drizzle with half of mayonnaise and top with another tortilla. 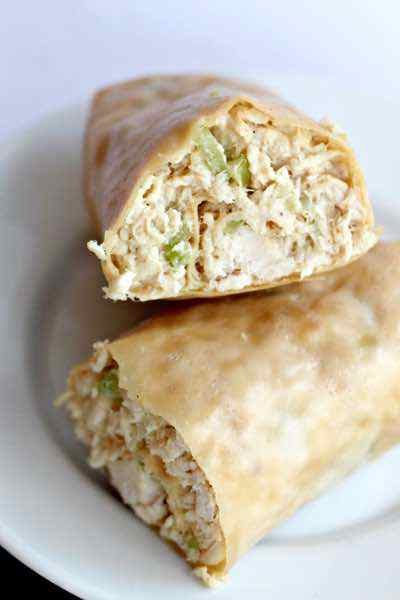 Repeat with the remaining tortillas, chicken mixture and mayonnaise. 10. Bake in the preheated oven for 10 minutes. 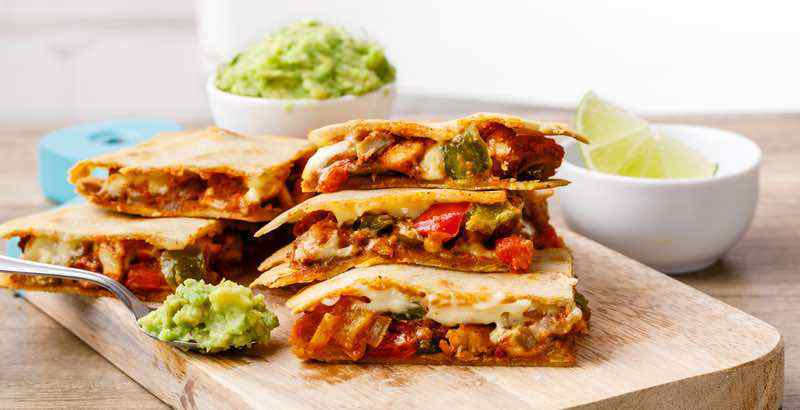 Remove from the oven and slice the quesadillas into quarters. Serve warm. 1. Place the chicken into a slow cooker. Stir in chicken stock, onion, garlic, carrots, celery, thyme and bay leaf. Season with salt and black pepper, to taste. Cover and cook on low heat for 6 hours. 2. Remove the chicken from the slow cooker and shred, using two forks. Return the shredded chicken to the slow cooker. 3. 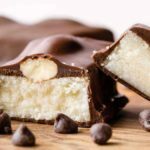 In a bowl, combine almond milk and arrowroot flour. 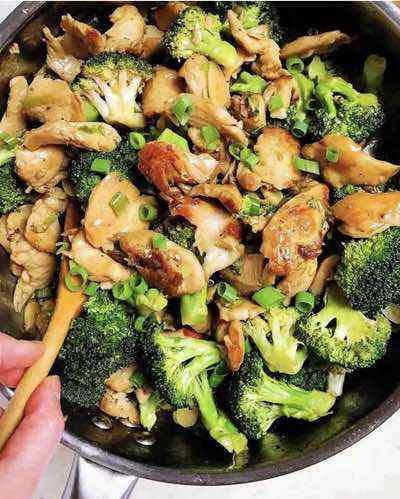 Stir the almond milk mixture and broccoli into the slow cooker. 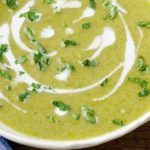 Cover and cook on low heat for an additional 30-60 minutes, or until broccoli is tender and soup is slightly thickened. 4. Serve immediately, garnished with parsley. 1. Preheat oven to 400°F. Place the chicken in a pot and cover with water. Bring to a boil then reduce the heat and simmer for 20 minutes. Drain the chicken and cut into bite size pieces. Set aside. 2. Place the cauliflower florets in a food processor and pulse until the mixture has the texture of rice or couscous. 3. 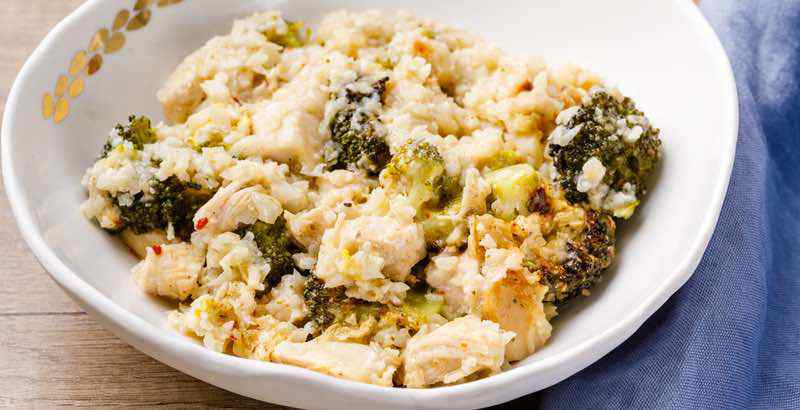 In a baking dish place the cauliflower rice, broccoli and chicken and toss to combine. Season with salt and black pepper to taste. Set aside. 4. In a sauce pan heat the olive oil over medium heat. Add the arrowroot flour and stir until golden. Add the stock and almond milk and mix to combine. Cook, stirring occasionally, until the sauce thickens. Remove from the heat. 5. Add the onion powder, garlic powder, red pepper flakes, dried thyme and fresh parsley and mix to combine. Pour the sauce over the cauliflower rice mixture and mix to combine. 6. Bake in preheated oven for 40 minutes or until golden brown. Paleo tortillas or lettuce cups, diced red onion, avocado, cilantro or any other your favorite toppings. 1. 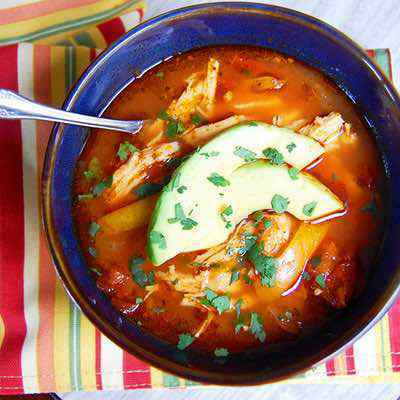 Place all the ingredients in a slow cooker and toss to combine. Cover with a lid and cook on low heat for 6 hours. 2. Remove the chicken from the slow cooker and shred, using two forks. Place the chicken on a baking pan, drizzle with 4 tablespoons of cooking liquid and toss to coat. Broil the chicken for 10-12 minutes to get the meat more crispy. 1. To make the crust, place all the ingredients in a food processor and pulse until a dough forms. Divide the dough into 4 discs, cover with plastic wrap and refrigerate for one hour prior to rolling out dough. 2. To make the filling, place the chicken breasts in a pot and cover with water. Bring to a boil then reduce the heat to medium and simmer for 10 minutes. 3. Add the green beans, carrot and celery and cook for 10 minutes. If necessary add more hot water to cover the veggies and chicken. Drain the chicken and veggies. 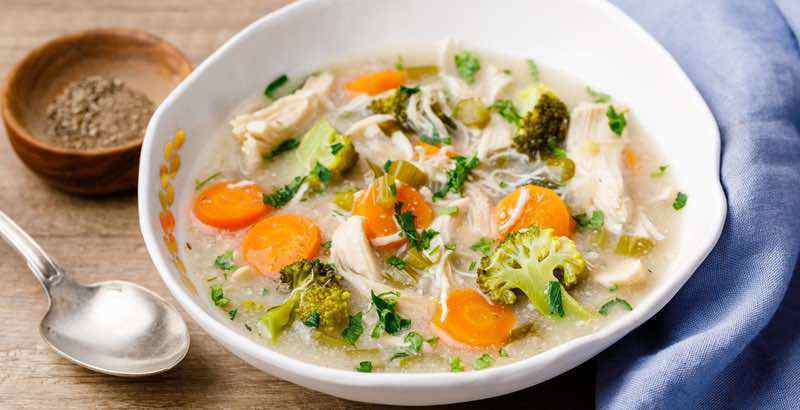 Reserve 1 ½ cup of cooking water if using it instead of chicken stock. Cut the chicken into bite size pieces. Set aside. 4. In a skillet, heat the olive oil and ghee over medium heat. Add the onion and cook for 5 minutes. Sprinkle the arrowroot flour over the onion and stir until golden. Add the stock and almond milk and mix to combine. Cook, stirring occasionally, until the sauce thickens. Remove from the heat. 5. Add the chicken, cooked veggies, dried thyme and fresh parsley and toss to combine. Season to taste with salt and black pepper. 6. Preheat oven to 350°F. Fill 4 individual pie dishes or ramekins with filling almost up to the top. (** see note). Roll each disks between two pieces of parchment paper until about 1/4” thick. Carefully place crust over filling and seal the edges. Using a thin knife, make 3 or 4 slits on the top crust. Brush with egg wash.
7. Bake in preheated oven for 30 minutes or until the crust is deep golden brown and filling is bubbling through. Serve warm. Note: *Instead of stock you can use coking water from chicken and veggies. **You can make one pie in a 9 inch pie dish or 2 smaller pies in two 6 inch pie dishes or you can make 4 personal size pies in ramekins or small pie dishes. 1. Preheat oven to 350°F. Place the chicken on a cutting board. Cut a horizontal slit through thickest portion of each chicken breast half to form a pocket, making sure not to cut all the way through. Thoroughly dry the chicken with paper towels. Season with the salt and black pepper on all sides and inside the pocket. 2. In a small bowl place the green olives and red pepper flakes and toss to combine. Stuff the chicken breasts with the green olive filling. Wrap each chicken breast in two slices of the prosciutto and lay the wrapped chicken seam side down on the prepared baking sheet. If necessary, secure with toothpick. 3. Bake in oven for 30 minutes or until chicken is cooked through. Serve warm. It’s not always easy to get just the right combination of spices and seasonings to make a delicious jerk chicken. So here’s a recipe that makes it all a lot easier and produces a quality meal every time. There’s a nice glaze to this chicken that means you get yummy flavor in each bite. 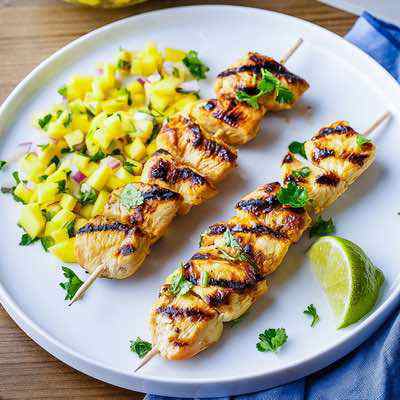 There’s also a Caribbean flare to the dish, with distinct flavorings you don’t get in some jerk chicken recipes. Here’s a way to have a sandwich without using any bread, because the chicken serves as the bread. On the inside they have it loaded up with bacon and pineapple, giving it the instant Hawaiian flavor which is where it gets its name from. 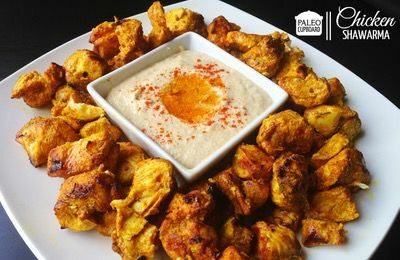 On Paleo you don’t have to worry about giving up your favorite things, like sandwiches, you just have to use substitutes or replacements like this recipe does so that you can enjoy the tastes you love without having to consume things that aren’t good for your body. This recipe reminds us that you don’t have to put on a three ring circus to make a delicious meal, and that if you simply add the right ingredients together you’ll come up with a winner. Here they’ve chosen garlic and lemon, a timeless classic that works on chicken and fish. 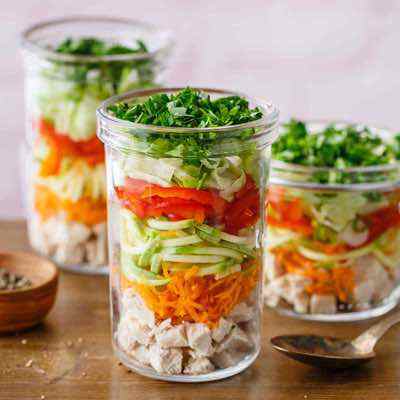 They use the chicken to sit on top of a salad, which shows that they’re in tune with the Paleo way of eating, and chicken always makes a great salad topper. We recommend spinach or kale as your salad, especially the baby versions of each for maximum flavor. Craving chicken parm but can’t have it because of the non-Paleo ingredients? This recipe shows you how to make chicken parmesan without using flour and breadcrumbs. Instead they’re using coconut flour, which will give this a nice light outer coating, which will be crispy and delicious. Cook it up in some lard and you’re good to go. 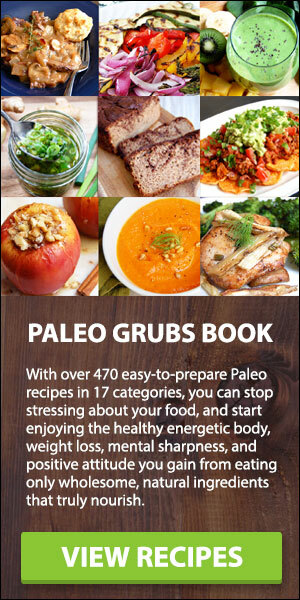 While most diet programs would give this meal the ax because of it being fried, and fried in lard for that matter, the Paleo diet doesn’t have a problem with it and considers it a wholesome meal. Bring things back to basics with this lemon garlic rosemary chicken breast recipe. 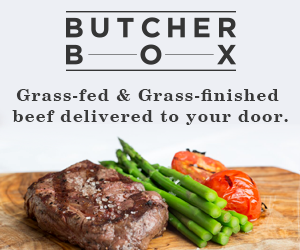 It includes what it contains in its title, so you’re getting the citrusy flavor of lemons mixed with the robust flavors of garlic and rosemary. This is good because chicken breast itself doesn’t bring much in the way of flavor, which is why it needs a good doctoring before you’ll want to eat it. 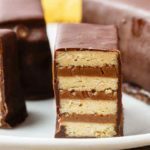 With a recipe like this it’s not just knowing which ingredients to use, but how to prepare it correctly, so be sure to familiarize yourself with the instructions before setting out on making it. 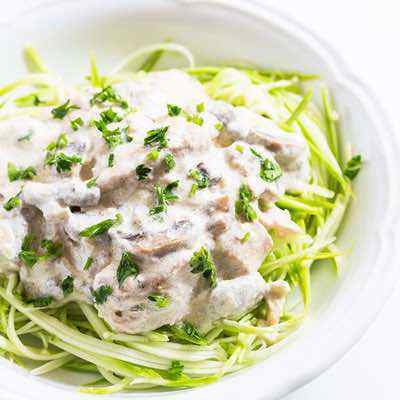 There’s really not much in traditional chicken puttanesca that you can’t have on Paleo, except for the noodles. 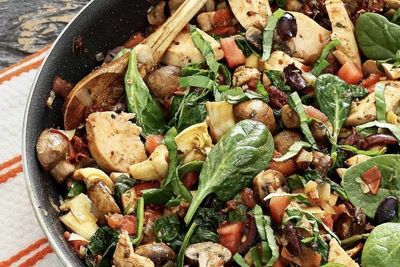 The recipe generally calls for tomatoes, olive oil, olives, capers and garlic, all of which are Paleo friendly, but pouring them over a pile of spaghetti just doesn’t fly. 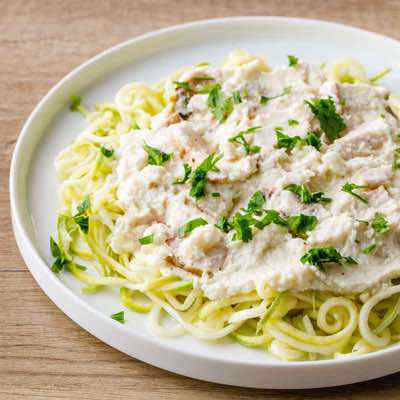 This chicken puttanesca recipe does away with the pasta but includes the other necessary ingredients so you’re getting all of the flavor without having to use ingredients that violate Paleo guidelines. 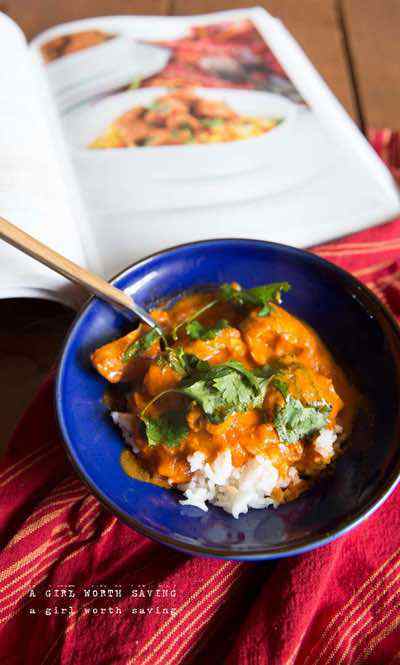 The end result is that you’re left with a spicy and tangy dish that you won’t soon forget. 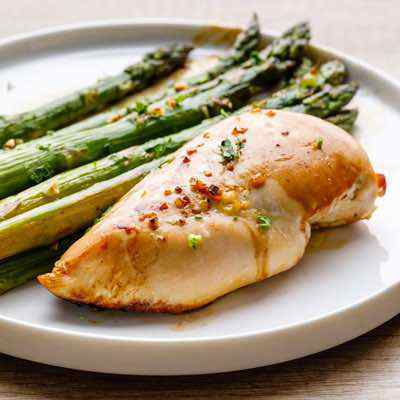 These chicken breasts are roasted and then topped with lemon slices so you’re getting a bit of spice to them, but also a tangy citrus flavor as well. 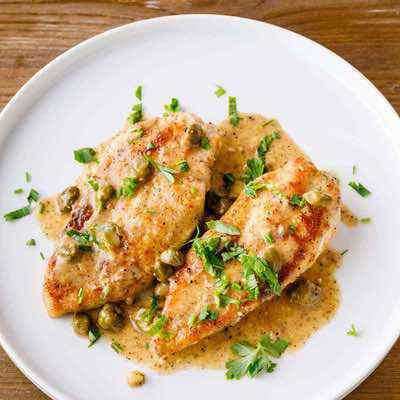 Cumin, oregano, and paprika combine to form a trio of spices that will wake up your taste buds for sure, and the presentation is kept simple with four lemon slices placed on top of each chicken breast. This would pair well with a side of broccoli, or a vegetable skewer, or any other veggie. Eating a split portion of meat and vegetables is the most essential aspect of Paleo dieting. Since bacon is not off limits on Paleo you’ll often see it being used to make the ordinary extraordinary. 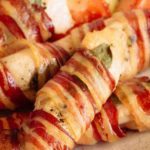 This bacon wrapped chicken breast recipe takes a chicken breast and fully encases it in bacon, then bakes it all up. That means you’ll get a crispy outer coating of bacon, and tender and most inner chicken breast. She’s even taken the extra step of stuffing the chicken that’s been wrapped, so it’s almost like opening a present and finding a surprise on the inside. She used artichoke hearts for the stuffing, so it’s going to add plenty of flavor as well as nutrients and fiber. You’d better be ready to back up your claim if you say you’ve got the world’s moistest chicken. There are so many things you can do to make sure that a breast of chicken comes out moist and delicious, and here they’re basically walking you through the steps for how to make it come out right. 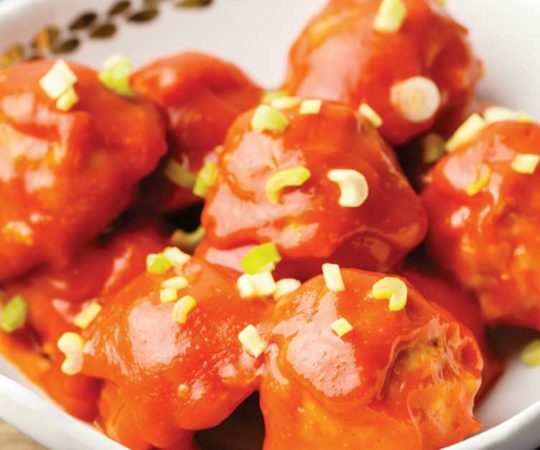 There isn’t much in the way of ingredients, but one of them might catch your eye: sriracha. This is one of the trendiest hot sauces going, and it may be one reason why this comes out so tender and juicy and tasting good. Getting Orange Chicken from the local Chinese chain is not allowed while on Paleo for a number of different reasons, but mostly quality control. 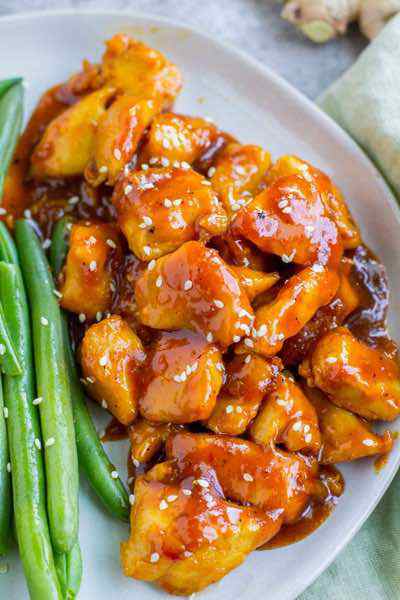 This Orange Chicken recipe brings things back to square one so that you can quickly and clearly see that there isn’t anything being used that will make you fat, clog your arteries, or muck up your digestive system. Orange juice provides the orange flavor, and soy sauce gives it a great color. You can also give it a rub with your favorite spice rub so there is a bit of customization to this. 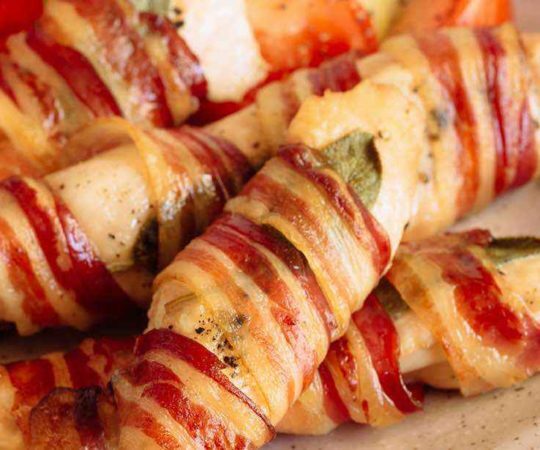 You’ve heard of chicken cordon bleu, but how about chicken cordon bacon? 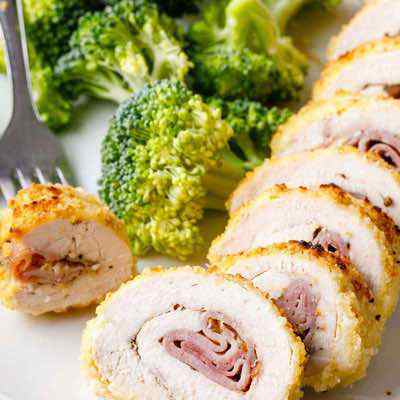 This chicken breast recipe takes the traditional way of making chicken cordon bleu and makes it easier and some would argue tastier. The inside of the chicken is filled with cheese, something you may or may not end up eating on Paleo, it’s really your call. They’re using cheddar, which could be replaced with a harder cheese like parmesan, or a goat cheese like feta for similar results. It’s the outer coating of bacon that really drives home the taste on this one. 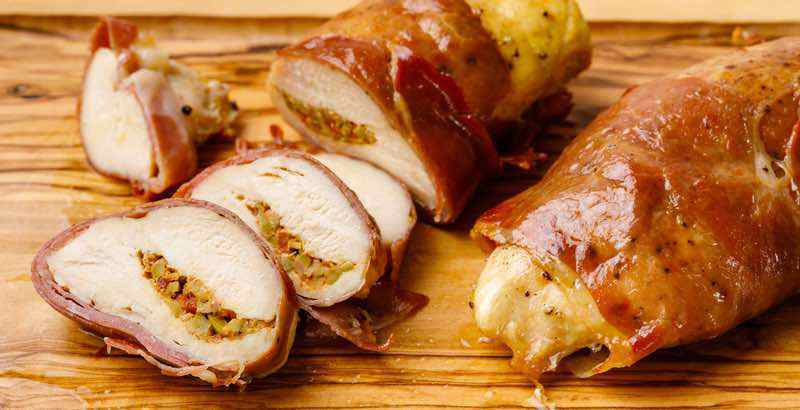 This chicken features pork two ways, with ground pork stuffed right into it, and bacon wrapped all around it. 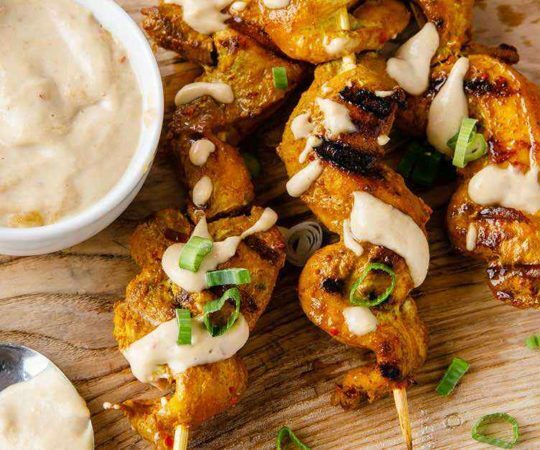 You’d be hard-pressed to find a porkier piece of chicken on the planet, and this is definitely not a dish you’d see on any other diet program out there. 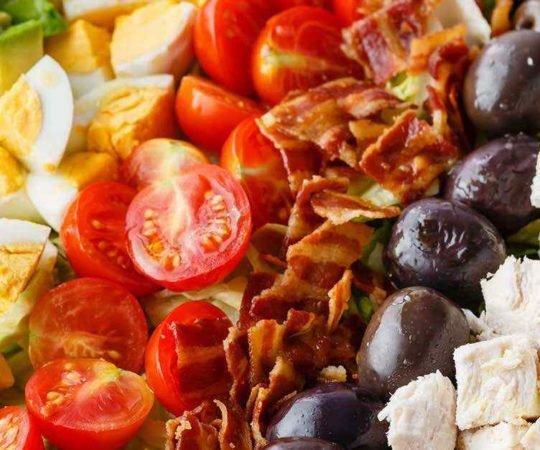 But bacon and pork are fair game on Paleo, and as long as you’re countering all of that meat with a bunch of vegetables you’re well within the realm of sticking to your Paleo eating. 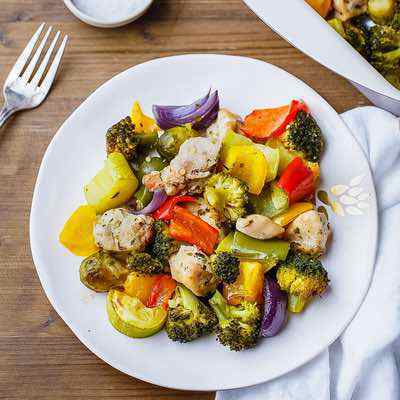 You don’t hear much about fruit on the Paleo diet because it takes a back seat to vegetables and meat, but this recipe has you stuffing the chicken with fruit and pistachios and then smoking the whole lot together. 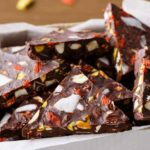 The result is a taste sensation that you’ll want to have again thanks to the flavor that comes from pineapple, oranges, and papaya. The pistachios add a nice bit of crunch for your teeth to keep busy on, as well as plenty of nutrition and flavor. 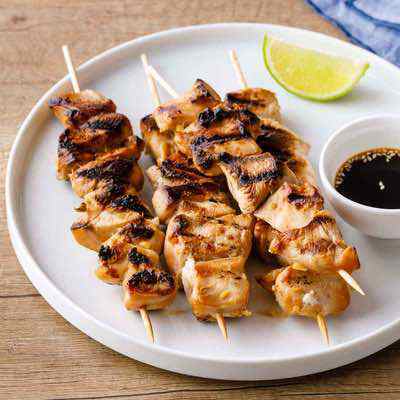 Ginger and white wine help make a wonderful marinade to extra tasty chicken. Strawberries are a great fruit to eat while on Paleo, as you can almost see our early ancestors happening upon a strawberry plant growing in the wild and helping themselves to the red bounty. Of course you’ll want to buy organic strawberries to try to replicate the kind they had back then, even though it will won’t be the same. They’ve combined these strawberries with almonds, so you’ve got two superfoods hard at work to make this a very healthy Paleo meal. It’s a meal because there’s also baby spinach stuffed into the chicken, giving you a serving of vegetables to go with your fruit, meat, and nuts. The cherries in this chicken breast will provide a nice tart pop to the meal, and since they’re combined with apples the sweetness from those apples will help with the tart flavor. 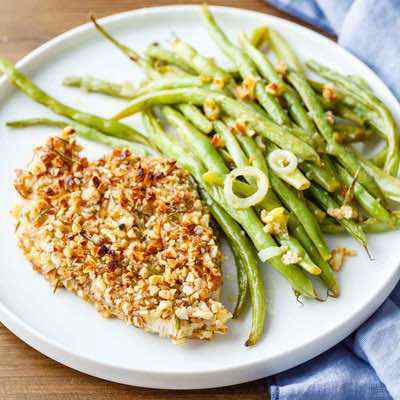 These fruits are mixed together with two different types of nuts, so you’re really getting a feast for the taste buds here, and this is one chicken breast you’ll want to slow down so you can savor. There’s even a marinade made from red wine and a cherry apple concentrate, so that flavor will permeate through the chicken, and gives it a nice flavor base to work from. Sun dried tomatoes have plenty of healthy benefits, so it’s no wonder that they decided to use them here as the inside of a sort of chicken breast sandwich. The bacon they’re using is free of nitrates, and it’s important to choose these types of high quality ingredients that break with convention and exclude things that are known to be bad for you. Uncured bacon is also recommended, and you should choose organic whenever you can. This will help cut down on all the nasty things used in conventional raising of livestock. While it’s not a perfect solution, it gets us back to a more pure form of the food that we’re eating. 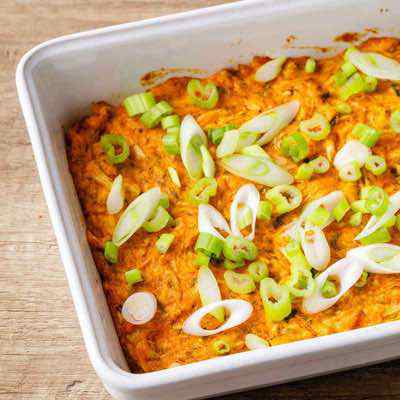 When you bake up this chicken and sweet potato dish you’ll have everything you need for a complete meal, all in one dish. It comes from a chef that specializes in Italian cooking, so you know that there’s authentic ingredients. Linda always cooks in a way that gives you the feeling like you’re having a meal that’s worthy of your time, and this one is no different. 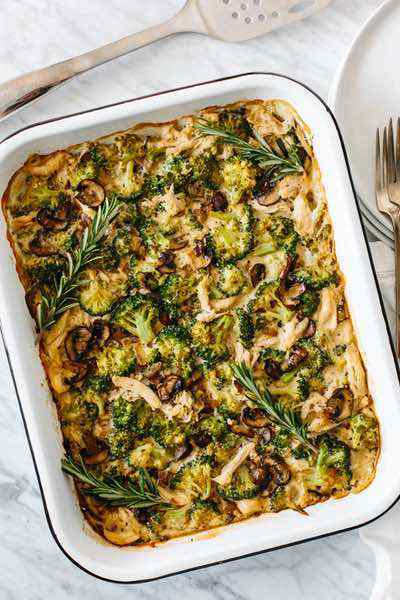 At the same time you’ll remark at how easy it was to get everything ready for the oven. In this chicken cacciatore recipe you’ll be getting all of the flavor from a traditional Italian kitchen right in your own home, and without worrying about gaining weight from it. 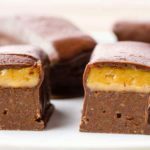 Much of the flavor has been kept intact while at the same time using ingredients that are all Paleo approved. 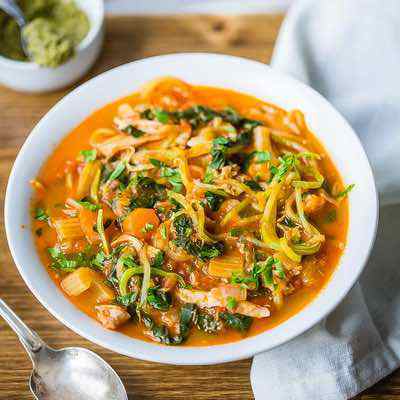 She’s done a good job of keeping things healthy as well, with old world spices that make you feel as if you’re at a fancy Italian restaurant, and a simplicity to the recipe that makes it all approachable and easy to follow. 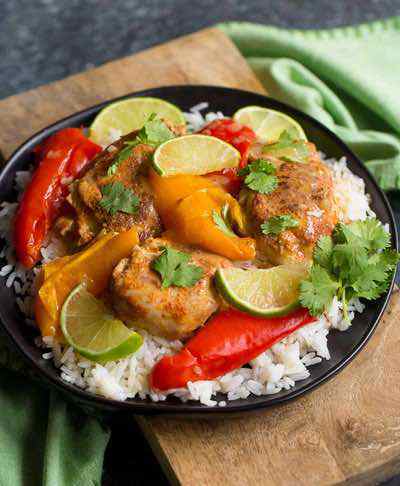 The spiciness is what you’ll taste first when you have this spiced ginger chicken. Then the flavor of the ginger will come through. It’s all in an effort to doctor up this chicken into something really special and make it a dish you’ll want to make again and again. 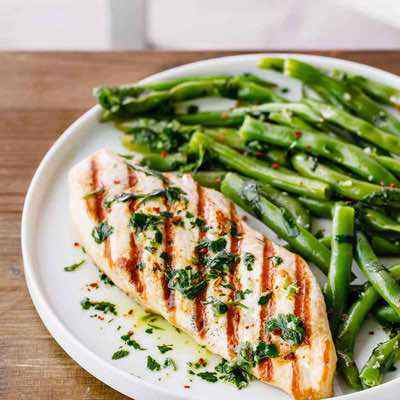 It is pretty much just a well-cooked chicken breast, so you’ll want to serve it with a side of vegetables to help round things out and make it a complete meal. Ahh thank you for featuring my chicken recipe!! Love your lists so much! 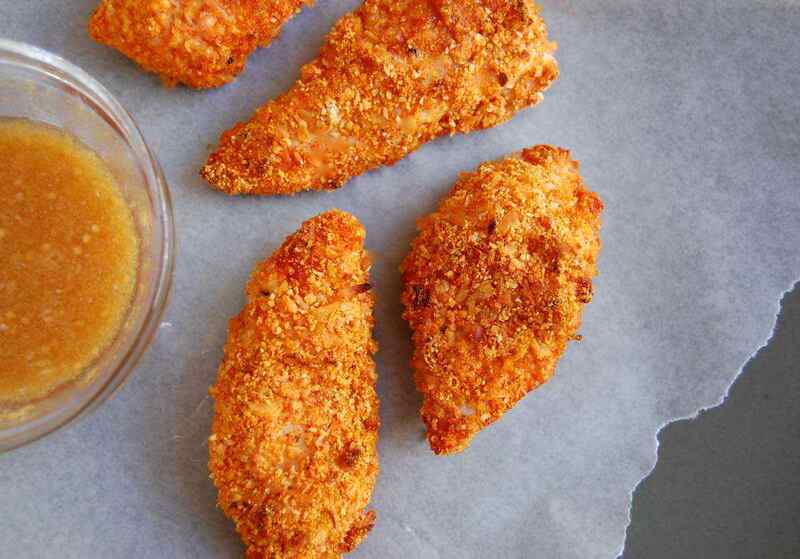 Thanks for including my skinny buffalo chicken strips–they’re one of my favorite treats! All the recipes here look great! 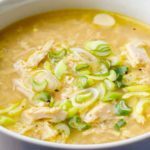 I’m looking for the Paleo Chili garlic sauce recipe used in the Spicy mustard Crockpot chicken. Thanks for including my ginger chicken. I am looking forward to trying some of these as we just recently started having chicken breast regularly (we usually get just dark meat, but lately I have been buying whole chickens and breaking them down) and I need more ways to use it.